Great for advertising indoors and outdoors! Backpack flags are effective and affordable tools to increase brand awareness or market your new products or services! Choose from a variety of shapes and sizes for a display that can travel anywhere. Create custom backpack flags for advertising your logo, slogan, or anything! Our big flags give you plenty of room for your message. Take backpack advertising flags to busy streets, malls, events, or any place crowds gather. These attention-grabbing displays follow you anywhere! Backpack advertising flags are the latest rage! 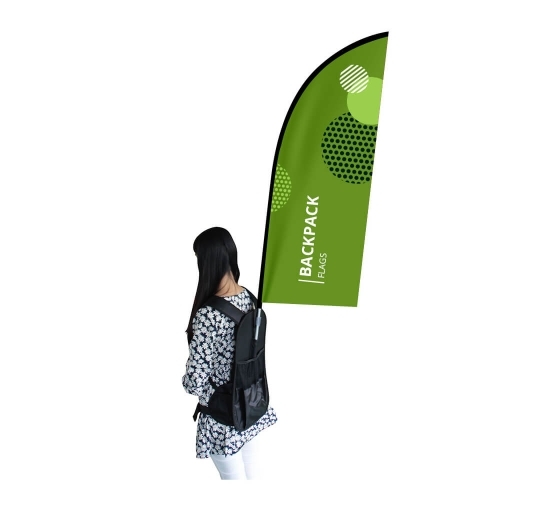 Mobile and portable, you can carry backpack banners and flags anywhere. Print double-sided so your audience sees your message from anywhere. Single-sided printing also available. Setup is easy! Slide the banner onto the pole and attach the pole to the pack. Your backpack advertising flag is ready to go in seconds. Order your customized backpack flags for advertising today!